David Axe is reporting from Afghanistan. On January 10, insurgents assaulted and captured a telecommunications building in the city of Sharana, in the southeastern province of Paktika. The assault, which claimed the lives of 10 people, demonstrated both the growing capabilities of the Afghan military and the insurgents’ continued ability to strike hard where least expected. At 8:45 in the morning, five insurgents – at least three of them dressed in Afghan National Army uniforms – opened fire on policemen guarding the Paktika Communications Directorate building, across the street from the Kabul Bank and just a block from a government command post and the local offices of the National Directorate of Security. Two policemen died instantly. The insurgents seized the building and 10 people working inside. The attack was unexpected. Not only did it strike at the heart of government power in Paktika, it came at the height of winter, traditionally a period of relative calm in Afghanistan, as conditions prevent insurgents from easily moving around. But striking the provincial seat also ensured the government response would be swift and overwhelming. 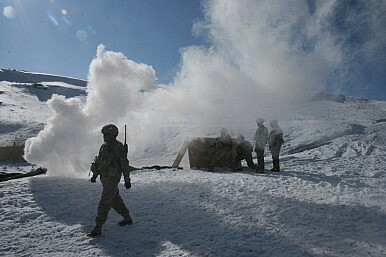 Within two hours, Afghan, U.S. and Polish troops had surrounded the building. Meanwhile, the governor, the provincial police chief, the local intelligence director and an Afghan Army officer convened in the command post to oversee response operations. They immediately ruled out an assault by the regular Afghan Army, as several of the insurgents were in army uniforms. The potential for confusion was high. But one Afghan military unit doesn’t wear the army’s standard green camouflage. The Provincial Response Company, a new Special Forces-style unit, wears old U.S. Army desert camouflage. The Afghan leaders ordered the PRC to recapture the building. It would take three tries, during which one PRC trooper would be shot dead. Meanwhile, the streets around the telecoms building was laced by gunfire. U.S. Army Lt. Col. Curtis Taylor, visiting Sharana with his staff, was caught in the fighting. “I burned through a whole basic load [of ammunition],” Taylor says. Taylor’s interpreter describes a Rocket-Propelled Grenade passing six feet over his head. The first PRC assault, entering through the wide front door at around 1:00, ended in retreat after an insurgent blew himself up using an explosive vest. Twenty minutes later, the roughly 20-strong PRC force entered again through the front door. They cleared the first two stories, but retreated after another suicide bomber blew up and Taliban gunfire killed one soldier. At that point, the Afghan leaders asked for NATO’s help. Two hours later, Polish commandos joined the PRC unit in a third assault, entering from a side door. At 3:24, the building was declared secure. Besides the two policemen and the PRC trooper, two civilians were killed along with the five Taliban. A NATO report praised Paktika’s leaders for their close coordination during the fighting, but offered a mixed assessment of the PRC. “This operation proved that while the PRC is a well-trained and capable force, they are not yet ready for independent operations,” the report stated.